Pocket COMMAND Center™ 2.0 Maturity System Kit - Gilson Co.
HM-680 Pocket COMMAND Center™ 2.0 Kit is recommended for initial set up of concrete maturity testing systems and includes everything required to perform maturity testing, collect sensor data, and transfer to a Windows-based PC for viewing, analysis and reporting. 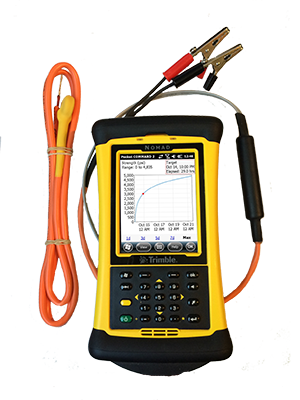 The Kit includes a Trimble® Nomad® 1050 Handheld Computer with pre-installed software and 50 HMA-700 4ft (1.2m) Sensors. 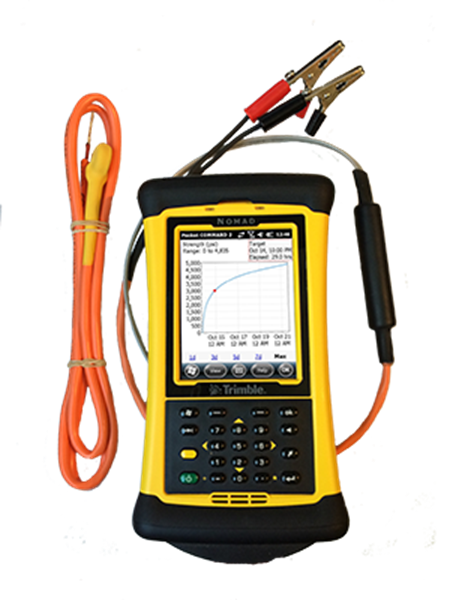 The rugged IP68 rated Nomad device features a DB9 serial port, wi-fi connectivity for direct emailing of data files and 15-hour battery life. Reporting and analysis Software for Windows devices is a free download and provides temperature graphs, maturity index and strength estimates using either the Nurse-Saul or Arrhenius maturity equations. The HMA-704 USB Download Cable can also be purchased separately to independently download data from the Sensors directly to the user’s computer. *Note - Logging intervals for the Sensors are factory set and must be specified when ordering. 15 or 30-minute intervals are recommended to comply with ASTM C1074 requirements.